The Miami Heat go for their sixth straight victory when they face the Los Angeles Lakers at the Staples Center. In what was expected to be a marquee showdown between the Miami Heat and Los Angeles Lakers is instead shaping up as a one-sided affair. LeBron James and the Heat go for a sixth consecutive win as they visit the Kobe Bryant-less Lakers on Christmas Day. While the NBA was hoping to showcase James and Bryant during its nationally televised five-game slate, this contest won’t have nearly the same appeal with Bryant again on the sidelines. Bryant, the league’s fourth all-time leading scorer with 31,700 points, is out with a fractured knee after missing the first six weeks while recovering from a torn Achilles. James, meanwhile, is coming off one of his best efforts of the season, posting 38 points, eight rebounds and six assists in Monday’s 121-119 overtime win over Atlanta. Miami (21-6) trailed by as many as 11 in third quarter and seven with 90 seconds left in regulation before storming back. "Obviously, after going through what we experienced last year in The Finals, it’s never over," James said. "So we just keep fighting until the end." 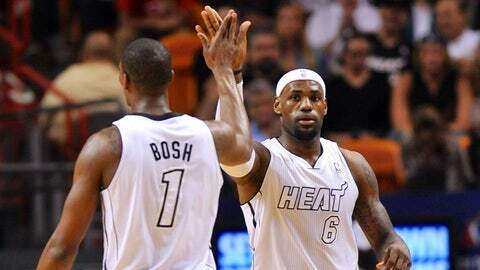 The Heat, averaging 114.2 points during their winning streak, are 16-2 when scoring more than 100. They are 9-0 when James scores at least 27. That doesn’t bode well for the Lakers (13-15), who have had their hands full with James over the years. The four-time NBA MVP is averaging 29.8 points over his last 13 matchups versus Los Angeles. "He’s playing at a very, very high level, gets better every year, which is scary," Lakers coach Mike D’Antoni said. "You try to just contain him as well as you can." James totaled 71 points and shot 67.4 percent as Miami swept last season’s two-game series. The Heat have taken six of seven from the Lakers dating to March 2010. Los Angeles has dropped six of nine overall after getting blown out 117-90 at Phoenix on Monday. The Lakers were held to 37.0 percent shooting and outrebounded 62-39. Nick Young shot 6 of 17 but finished with a team-high 19 points off the bench, and Jodie Meeks scored 18. Pau Gasol was limited to 10 on 4-of-12 from the field after missing the previous game due to an upper respiratory infection. "Right now Phoenix is a better team than us, especially in the condition we are in," D’Antoni said. "We are fighting with a bunch of good guys that played well before and they will play again. … We are not going to give up." In addition to missing Bryant, the Lakers are dealing with injuries to Steve Nash (back) and Steve Blake (elbow). Fellow point guard Jordan Farmar, though, has been cleared to play and is set to make his first start after missing the last 10 games with hamstring trouble. "We need to get some playmaking back in there," D’Antoni said of Farmar, who is averaging 9.2 points in 18.9 minutes. The Lakers could also use a big performance from Gasol, who is averaging 14.8 points – 3.5 less than his career mark. Los Angeles is 9-5 when he scores at least 15 compared to 4-9 when he doesn’t. Gasol has managed 11 and 12 points in his last two games versus Miami. The Heat have won 18 consecutive regular-season matchups against the Western Conference, including six this season by an average of 14.9 points. Only one of those victories, though, came on the road, where Miami is averaging 100.0 points compared to 108.1 at home. Dwyane Wade could return after sitting out Monday to rest his knees. Wade is averaging 25.8 points and shooting 60.0 percent over his last four games.